Arriving in China in 1946 as a student, David Kidd witnessed Peking in its grandest splendor: "a great walled and moated medieval city" through which pulsated a life in what was considered "the world's largest empire." Within its walls lay the Forbidden City, the center from which "imperial power reached out to all of China, and from there, the world." He hobnobbed with other expatriate elite, and married Aimée Yu, the daughter of a high ranking supreme court justice, and member of one of the richest and oldest aristocratic families; it was just about the time of the Communist take-over of Peking. 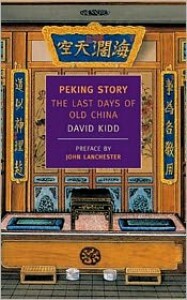 Through several vignettes in Peking Story, Kidd reminisced of his Chinese family -by-marriage: a proud, privileged family living a lavish lifestyle; of centuries-old traditions and a culture steeped in ancient spirituality and beliefs- which all collapsed, destroyed under the Communist regime. Kidd recalled his friends, acquaintances and Chinese family with strong particularity and a bit of humor. From the disheveled Reverend Feng, who performed his wedding ceremony in unintelligible chants; his once trusted cook turned street beggar, Lao Pei, who sued him in court; his costumed -party guest who was a Mongolian prince dressed as a Mongolian Princess; to Aunt Chin who could trace her Manchu roots to an empress of China: "an authority on the history and lore of Peking , and an inexhaustible well of information- true, false and absurd- about the city." Houses and people and tables and chairs move and change of themselves, following destinies that cannot be altered. When things change into other things or lose themselves or destroy themselves, there is nothing we can do but let them go. The final portion of this memoir, when Kidd returned to Peking in 1981, was so poignant. Not only was Peking unrecognizable, but the living conditions of the 'New China' where the remnants remaining Yu family lived, was depressing: it just showed how disastrous Mao's Cultural Revolution turned out to be. Kidd kept the tone of Peking Story light, not expounding on the horrifying scope of Communism in China, but illuminated the inevitable changes, not only in the culture, but the life of the Yu's. His account of his years in Peking, living with his wife in the Yu mansion, was slightly satirical and generously vivid. His attention to detail evoked melancholy at such deeply felt and personal losses brought on by the winds of change of Communism ; losses not just of the beauty and opulence of an ancient city, but of the treasured life by which one particular family thrived for centuries, who knew of nothing else, and never would come close to such a thing again. This was a wonderful memoir of an enchanted life. It may seem superficial to some but it proved that, whether privileged or poor, change and destiny can't be escaped.